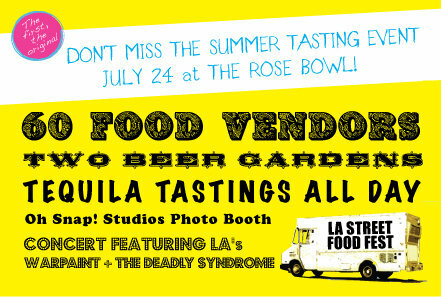 Following a February event that NBC’s Joshua Lurie called “a culinary earthquake that has triggered several mobile aftershocks,” the LA Street Food Fest returns with an all-new Summer Tasting Event on Saturday, July 24th at the Rose Bowl. Event co-founders Shawna Dawson (Sauce LA) and Sonja Rasula (UNIQUE LA) have addressed the crowds and long lines from the February Street Food Fest by capping attendance for the Summer Tasting Event at 5,000 (the Rose Bowl was built to handle crowds in excess of 90,000). Additionally, the all-inclusive tickets will be pre-sale only, and exclusively available online. Sonja (L) and Shawna (R) bid you welcome. For the price of one ticket, guests can sample signature bites from over 60 vendors, including gourmet food trucks, Old School carts and stands, celebrity chefs, and street-inspired dishes from some of LA’s best restaurants. 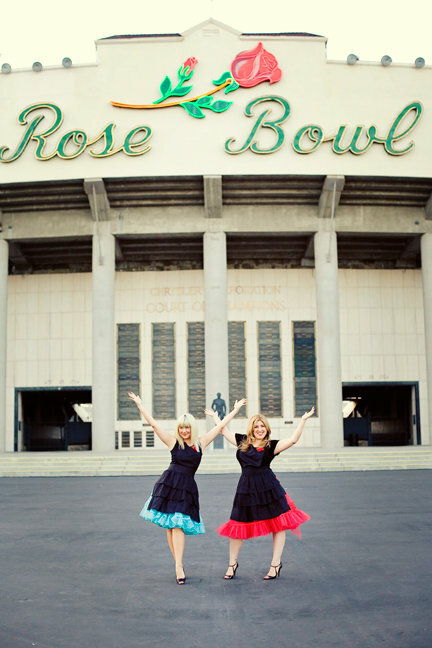 Vendors will be serving from tented booths on the field of the world famous Rose Bowl, where attendees can grab a blanket and enjoy their food on the grass, dine at a picnic table or in a shaded lounge, or work on their tan up in the stands. The Summer Tasting will also include free prints from the Oh! Snap photo booth, live entertainment, raffle prizes and giveaways, plus free parking in the Rose Bowl parking lot for all attendees. Tickets are on sale now, available only through the Summer Tasting Event website and Eventbrite. No tickets will be sold at the door. Children age 7 and under are admitted free with a paying ticketed adult. Update 7/11: half the tickets have already been sold, according to a comment posted yesterday on the event’s Facebook page.